IFS officers say staff brave dangers, but the job has little recognition and low pay. New Delhi: On the morning of 8 January, Sudha Dhurve, a forest guard in Madhya Pradesh’s Satpura tiger reserve, left for work along with two of her colleagues. Everything about the day felt as ordinary as any other. Except, that day, she was to have a 90-minute stare-down with a tiger from a distance of less than 10 metres. What followed was an hour-and-a-half-long stare-down with the angry big cat. During this time, the tiger growled several times, even as he continued to stare the trio down. But none of them moved – moving would have meant death. “Initially, I was anxious… By the end of it, I had become numb,” Dhurve, who is all set to be felicitated by the forest department on 26 January for saving not just her own, but the lives of two of her colleagues, said. 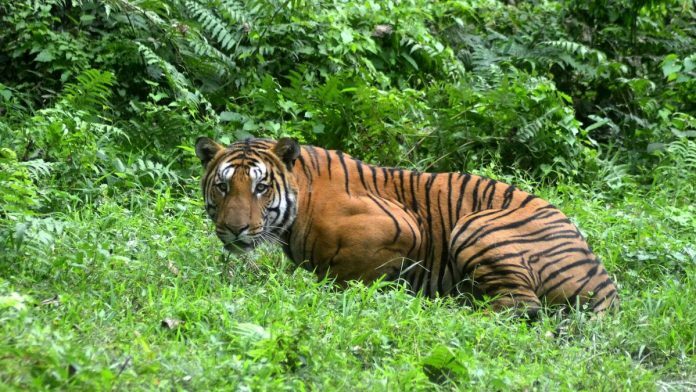 While her encounter with the tiger may have caught the department’s attention, for Dhurve, situations like these are “just part of her everyday job”. Her boss, the field director of the tiger reserve, S.K. Singh, agrees. “We applaud her for her courage, and are going to felicitate her, but this is really nothing special for us, it’s our job,” Singh said. “She saved not just her life but that of two other people, so it is commendable, but having said that, it is routine work,” he added. While being in the forest department may not be a job for the faint-hearted – it is a job that requires dodging forest fires, mitigating man-animal conflicts, combating illegal activity and encountering wild animals on a daily basis – there is also the problem of demoralising state apathy towards the services of the field staff. “The government doesn’t really appreciate the work we do… We are neither paid well nor recognised for our job,” Dhurve says. “We have no protection when we go into the jungle… The government has given us no equipment, we just set out to do our jobs with one stick in our hand,” she says. “There is no power, no electricity, no network or sometimes even drinking water in places we have to stay in,” she added. “There are times people have to travel 500 km outside of a jungle to talk to their family… But nobody knows about these struggles,” Dhurve, whose husband is also a forest guard, said. Parveen Kaswan, an IFS officer, agreed with Dhurve. As a result, young people are less inclined to be recruited as forest staff. Little recognition, coupled with low pay, is an obvious disincentive. “Even when someone becomes a forest guard, they keep appearing for other exams in search for better, more secure government jobs,” Dhurve said. “Also, the forest and environment departments are majorly into regulatory work, which is not appreciated by both public and governments,” he added. Moreover, to be recruited as a forest guard, one needs a high level of technical education – B.Sc. or M.Sc – but the positions are not gazette in many states. “On the one hand you want such high degree of expertise, and on the other the positions are not even gazetted… So who would want to join?” an IFS officer, who did not want to be named, pointed out. Governments, on the other hand, seem happy to rely on contracted staff. They are cheaper, and cost between Rs 6,000-Rs 10,000 a month. According to data available with the Wildlife Trust of India, the vacancies in the tiger reserves are crippling. The Palamau reserve in Jharkhand has a 70 per cent vacancy of formal staff. The Dampa reserve in Mizoram is a close second with a 69 per cent vacancy. Indravati reserve in Chhattisgarh, Udhagamandalam and Anamalai reserves in Tamil Nadu and Sanjay-Dubri reserve in MP all have a vacancy of more than 40 per cent. The famous Corbett reserve in Uttarakhand doesn’t fare any better with a 40.48 per cent vacancy. “The government is not recruiting younger people, so the force is really ageing in one sense… But this is not work that old people can do,” said another IFS officer, not wishing to be named. Refreshing news. Salute! Let’s protect our wildlife; let’s save our forests.